Facepunch Studios have announced yet another work-in-progress title, this time all about the arcades. Aptly named “Arcade”, the game will encourage players to create and maintain their own arcade servers in which other players can play various arcade games to earn tokens. You’ll be able to watch while people play their games in real time, and compare scores on the high score tables. 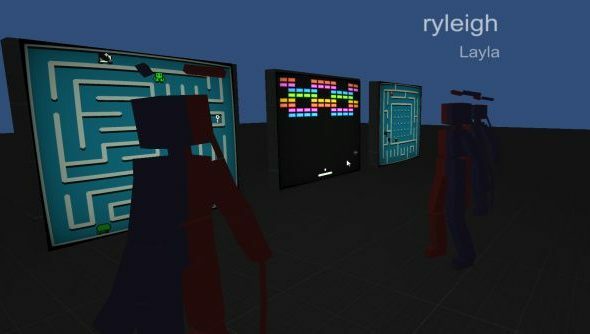 Facepunch’s Ryleigh Kotash gives a rundown of the idea behind Arcade. “Here’s the current idea for our prototype about arcades.” explained Kotash. “You explore an arcade in first person. The games cost tokens to play, and reward you with even more tokens if you do well. Use the tokens you’ve earned to play more expensive games. It’ll be exciting playing the games because you’ve got tokens on the line. Eventually you become the King of the Arcade and save it from being turned into a condo or something.